GOING DOWN: Local water storages have fallen to 45.8 per cent capacity compared to 60.4 per cent at this time last year. The first garden waste has arrived at a new $3.5 million facility to produce 35,000 tonnes of compost annually for Geelong parks, sports grounds and farming land, City Hall has announced. The Anakie facility was part of City Hall’s One Planet Living certification for “leading the way in creating a sustainable future for our region”, councillor Sarah Mansfield said. Consumers have used almost 820 million litres of water in seven days to leave local storages at 45.7 per cent capacity, according to official measurements. 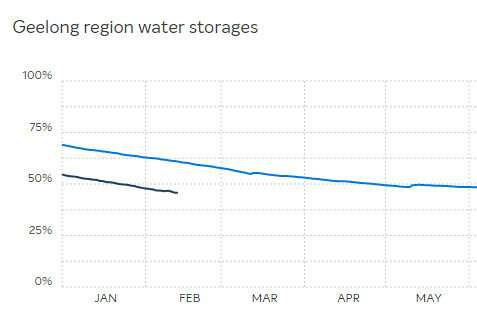 Barwon Water figures showed a 1.1 per cent decline in overall storage levels over the seven days to Tuesday despite recording 28mm of rain. Geelong’s council has committed $100,000 to pushing for regional fast rail that could deliver 32-minute services between the city and Melbourne. The two-year funding allocation would pay for a fast-rail strategy document this financial year and support a New Spirit of Progress Committee working on the initiative in 2019/2020, council said. Ambulance response times to local code-one incidents were two seconds slower in the three months to December than over the same time the year before, new figures show. Response time to code-two call-outs also increased by almost half a second, the figures showed, with local ambulances responding to a total 5888 incidents in the December quarter compared to 5743 for the same time in 2017. A “screening tool” for flesh-eating bacteria stalking the Bellarine Peninsula could emerge from the work of an African student in Geelong, according to Deakin University. Michael Selom Avumegah had “dedicated his PhD” mapping Bairnsdale ulcer cases while developing materials for potential risk tests at the university’s School of Medicine, Deakin said. Australian taxpayers should provide asylum-seekers with “adequate income and support”, according Geelong councillors. They voted this week to join 22 other Victorian councils opposing federal reversals of funding and assessment changes for asylum-seeker support services, noting that Geelong had 100 people awaiting decisions on asylum applications. A “humble man” who helped put 80,000 plants along the Bellarine Rail Trail deserves to have a Leopold reserve named in his honour, according to volunteers who worked beside him. Friends of the Bellarine Rail Trail has told City Hall that Fred Cook Reserve, on Christies Rd, would be a fitting tribute to the “honest, reliable and trustworthy” founding member, who died in 2017. A dozen children aged 12 to 16 will make recommendations to council on public issues as members of the city’s first “Youth Council”. Mayor Bruce Harwood unveiled the child councillors this week, saying they would help their adult counterparts “tap into the issues that are most important to the young people in our community”.